What happens if you lose a tooth in space? How does the tooth fairy get on the Shuttle? What might the tooth fairy bring you? the creator of the photo below. Click here to enjoy the International Space Baby. I have a Child Astronauts gallery on Flickr. I also have a gallery of Infant Astronauts. Used with permission. View more of her work on her blog. 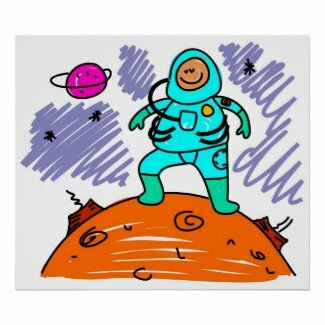 Click here for another of her illustrations of a woman with tattoos who want to go to space. It is called 'Outer Space Alien Poster'. What do you call a three year old astronaut? Available on EvgieNev shop on Etsy. Evgie sells handmade wall decals and removable stickers for children and grown ups spaces. 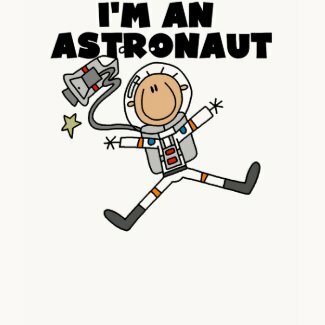 More child astronaut humor in my three e-books.